This ride heads inland through Los Osos Valley on Turri Rd to San Luis Obispo. Return west along the SLO Wine Trail on Corbett Canyon and Orcutt Blvd to Foothill Blvd followed by a climb up O’Connor Way to the military base and Cuesta College. Roll along Hwy 1 N back into Morro Bay and Los Osos. Exit Los Osos Community Park onto Los Osos Valley Rd and head north towards Morro Bay on S Bay Blvd. Turn right on Turri Rd and head east along Los Osos Creek. The gentle climb winds along the foothills of Hollister Peak. The road drops down into Los Osos Valley with gorgeous views of the open farmlands and Irish Hills in the far distance. Turn left and continue east on Los Osos valley Rd; this wide boulevard takes you through the gorgeous valley fields and pastoral lands. Enjoy the views of the Morros! The road exits the agricultural side of valley out to the commercial shopping district and auto row in San Luis Obispo; it comes to a T at S Higuera St. Turn left on Higuera Rd followed by an immediate right onto Vachell Ln; the road head south along the outskirt of town through an industrial area. The road curves to the left and name changes to Buckley Rd; this road cuts across the fertile valley towards the SLO Airport to Edna Rd/CA-227. Head south on CA-227 for the gorgeous ride through the vineyards and farmlands around Edna Valley. Stop at Old Edna Townsite for a quick pit stop and snack. You can walk around the grounds and check out all the historic buildings around the Townsite. Continue south on CA-227 to Corbett Canyon Rd. Turn left on Corbett Canyon and flow along the rolling hills through the beautiful hillside vineyards! The short cut across the valley on Tiffany Ranch Rd takes you through a small ranching community before coming to an end at Orcutt Blvd. Turn left and head west on Orcutt Blvd; the rolling terrain leads you through the valley vineyards along the SLO Wine Trail. The vineyards stretches out for miles and miles-enjoy the fabulous views! Look eastward and take in the scenic mountains along the Santa Lucia Range! Stop at Islay Park for a quick snack and water refill. The park sits below Islay Hill-the last of the Morros at the east end of the volcanic chain. Exit the park and stay on Orcutt Blvd to Johnson and California Blvd; these roads travel through the residential neighborhoods along the eastern edge of SLO towards Cal Poly. Head west and cut across town on Foothill Blvd before dropping down towards Los Osos Valley. Make a right turn onto O’Connor Way; this quiet back road heads up from the valley to Camp San Luis Obispo. It cuts through the military base to Cuesta College; it’s a safer access route for students attending the college. The road aka “Wayne Willams Bikeway” is open from 7 AM to 6 PM seven days a week. O’Connor Way travels up through a scattering of homes and ranches before reaching the open gates into the military base. The gentle climb offers superb views of the Morros; Bishop Peak, Chumash Peak and Carro Romauldo! Make your way around the base to Cuesta College on O’Connor and Colusa Ave to Hollister Rd and Hwy 1. Turn left onto Hwy 1 and head west for the next 4.8 flat windy miles into Morro Bay. You’re near Morro Bay when Hollister Peak and Cerro Cabrillo come into view. Exit Hwy 1 and make a left at San Bernardo Creek/Quintana Rd to Morro Bay. Turn left on S Bay Blvd and roll pass Morro Bay State Park and Morro Bay Estuary into Los Osos. 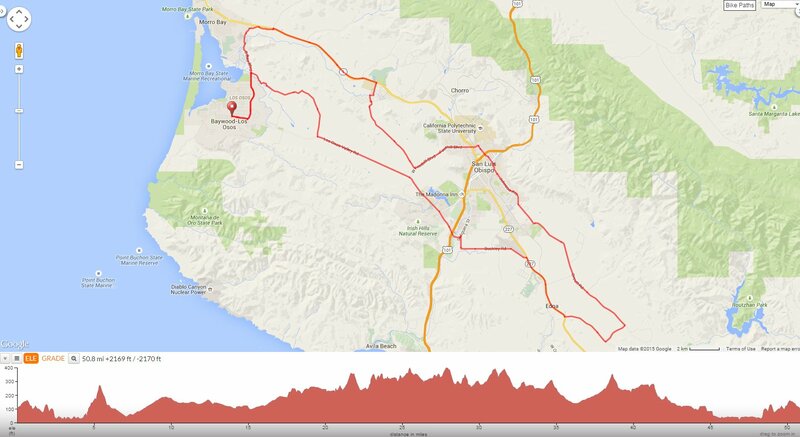 This is a great ride along some of the country back roads from Los Osos to San Luis Obispo. You’ll enjoy the gentle climbs and scenic stretches along the beautiful valleys and vineyards on the SLO Wine Trail! Come on out and explore! Weather: Overcast skies with some afternoon sun. Temps ranged from the low 50’s to the low 80’s with brisk NW winds. Just wonderful !! Whats Next ?……… From Michael and Maydene !